Can analyzing data differently help predict and avoid collisions in the aviation industry? Qingguo Xu, DPhil, a 2018 winner of the ORAU Ralph E. Powe Junior Faculty Enhancement Award, seeks better methods for drug delivery in the treatment of eye disorders, cancer and other diseases. He is assistant professor in the Department of Pharmaceutics, School of Pharmacy, Virginia Commonwealth University (VCU) and in the Department of Ophthalmology and Massey Cancer Center in the VCU School of Medicine. At VCU, Xu oversees an active research program with funding from the National Institutes of Health’s National Eye Institute (NIH/NEI) and the U.S. Food and Drug Administration (FDA), totaling more than $3 million. Funded for five years, the NIH research project seeks to develop long-lasting formulations that can safely and effectively treat or prevent corneal graft rejection. He has a broad background in materials science, drug delivery, nanotechnology, and physiochemical characterization of mucosal and tissue barriers to achieve effective drug delivery. “I am very appreciative of the Powe Award because it has expanded opportunities for me to advance my research,” said Xu. The Powe Award funding allows him to investigate neutron scattering in the application of nanotherapeutic-based treatments. More simply, Xu is researching the structure of the sclera (the white outer layer of the eyeball and a major barrier to ocular drug penetration). He is inventing new methods and technologies to enhance the transport of drug molecules through the scleral membrane for effective and safe intraocular drug delivery. In collaboration with scientists at Oak Ridge National Laboratory, Xu is applying the neutron scattering technique SANS (small-angle neutron scattering) to study the structural change of sclera resulting from the presence or absence of drugs and nanomedicines. Current practices, such as repeated injections or frequent use of eye drops, may be improved by new drug-delivery technologies to overcome biological barriers. These technologies would be less invasive than intravitreal injections, which are used to administer medications to the back of the eye in the treatment of retinal conditions. “This research will be applicable to many other diseases like cancer, neurological disorders and autoimmune diseases,” said Xu. Ultimately, Xu’s research will lead to enhancing the effectiveness of therapeutics to prevent blindness, as well as improve the delivery of a broad range of medications for treating other diseases. Xu received advanced training in engineering principles and materials science while earning his doctorate at the University of Oxford, United Kingdom. As a postdoctoral fellow at the Wilmer Eye Institute at Johns Hopkins University, he obtained further expertise in applying these skills to nanomedicine in ophthalmology. “Fortunately, my educational training in several different areas prepared me to achieve results in the various aspects of my current work,” said Xu. 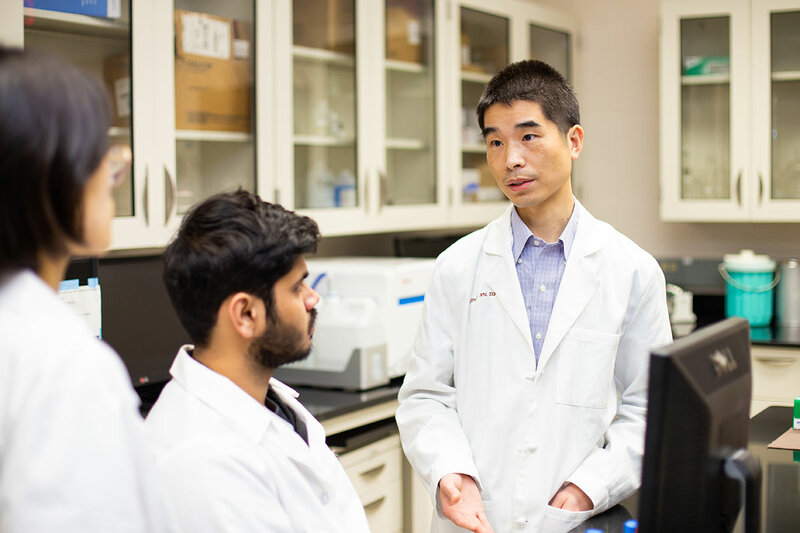 In addition to his research at VCU, Xu brings his cutting-edge knowledge in transdermal and ocular drug delivery to undergraduate, graduate and professional (PharmD) curricula. He is one of the initial faculty hires in support of developing and implementing a new degree program in pharmaceutical engineering at VCU, a collaborative effort between the School of Pharmacy and the College of Engineering. Sponsored by ORAU, the Ralph E. Powe Junior Faculty Award provides funds to enrich the research and professional growth of faculty during the early stages of their careers. Virginia Commonwealth University (VCU) is one of 122 member institutions of the ORAU consortium. Xu is one of 36 awardees to receive the Powe Award for the 2018-2019 academic year. Each recipient’s institution matches the ORAU award amount of $5,000 with an additional $5,000, making the total prize worth $10,000 for each winner. Winners may use the grants to purchase equipment, continue research or travel to professional meetings and conferences. For more information about the Powe Junior Faculty Enhancement Awards, contact the University Partnerships office at 865.576.6513 or PoweAwards@orau.org.